Contenders can take BootStrap Quiz to improve their experience in the technical stream. We have provided the BootStrap Multiple Choice Questions in this article. People should know that the companies will conduct an online test and then they will take the technical interview. So, to qualify for the first round, aspirants have to practice Quiz based on the BootStrap. Applicants can learn and practice the various BootStrap MCQ as much as required. In the following section, candidates can find the benefits of BootStrap Online Test and BootStrap Online Test Results. Totally BootStrap Quiz consists of 26 Questions. And the time allocated for the examination is 30 Minutes. There is no negative marking and each question carry 1 mark. Moreover, have a hit on the ‘Submit Test’ button arranged at the end of this page to submit the responses. The BootStrap Quiz gets submitted after the time is Expired. And aspirants should not refresh the Page till the end. 1. Which of the following is correct about Bootstrap Media Query? A. Media query is a really fancy term for "conditional CSS rule"
2. Which class creates a list of items? 4. Which of the following class applies the hover color to a particular row or cell of a table? 5. Which plugin is used to cycle through elements, like a slideshow? 7. Which of the following is correct about data-trigger Data attribute of Tooltip Plugin? 8. Which of the following bootstrap style of button makes the button size large? 9. Which of the following bootstrap style can be used to to get different size items of .pagination? 10. Which of the following is correct about data-trigger Data attribute of popover Plugin? A. Sets the default title value if the title attribute isn’t present. B. Defines how the popover is triggered. D. Delays showing and hiding the popover in ms.
11. What layout is used for providing 100% width in Bootstrap? 12. Which class indicates a dropdown menu? 13. ______ stars and _____forks are there in bootstrap. 14. Bootstrap 4 has how many versions? 15. Which of the following is correct about bootstrap media objects? 19. Which of the following bootstrap styles can be used to create a Animated progress bar? 21. Which of the following aspect ratio is used with responsive video in bootstrap? 23. Which class is used to make a standard/default button in bootstrap? 24. Which of the following contextual class is used for warning purpose? BootStrap is the language that supports the latest versions of the Google Chrome, Firefox, Internet Explorer, Opera, and Safari. And by facing this BootStarp MCQ Online Test candidates can know the concepts from the primary level. Having the idea makes the aspirants strong enough to face any competitive exam. Moreover, by meeting this quiz will help the professionals to become robust in the fundamentals. Also, the BootStarp Questions included in this are beneficial. Within the short span of time professionals can get a broad idea on each topic. These templates are included for typography, forms, buttons, tables, navigation, models, and image carousels. Moreover, with the help of BootStrap, we can have the ability to create responsive designs easily. Furthermore, BootStrap is open source toolkit which helps in developing the HTML, CSS, and JS. By using this, we can immediately build our ideas or prototype the entire app with the Sass variables and mixins, large prebuilt components, and powerful plugins built on jQuery. For any competitor Time Management is the essential factor. That can be attained by facing this BootStrap Quiz. If the aspirants keep on practicing this BootStrap MCQ Online Test accuracy gets enhanced. All the skills like logical, Reasoning are improved. And facing the interview sessions becomes more natural than before. They can attain better result than usual. After completion of the BootStrap Quiz candidates should submit the responses. And after having a hit on the submit button only candidates will be displayed with the results. Also, we request the aspirants to have a view on the results. This BootStrap Quiz also includes the BootStrap Question and Answers which help the candidates to redress the mistakes. 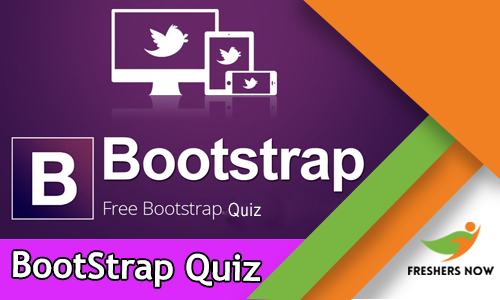 Moreover, the information on BootStrap Quiz in this page is informative and useful. So, we request the aspirants to keep on visiting our web portal Freshers Now on regular intervals. Furthermore, aspirants can get the extra information on the BootStrap Quiz. We will be regularly updating our web portal with more furnished information.